President Obama's emotional announcement brought out plenty of emotions from the presidential candidates campaigning in New Hampshire. Political analyst Scott Spradling described it as a good redmeat debate for both Republicans and Democrats. Spradling is watching as both sides try to make hay out of President Obama's executive order on guns. He said, "For Democrats, they're going to be able to argue that this is a great step in the right direction, it's what we've been calling for all along on the campaign trail, but it's not enough and here's what I would do." Hillary Clinton praised Obama for his attempt to reduce the number of mass shootings and killings in the United States. Bernie Sanders says, as president, he would continue with even more executive orders - The exact opposite of what the Republicans are saying. Candidate Jim Gilmore said, "The president is suggesting he can rule by decree. That's not right. If the Congress doesn't act, that doesn't mean he has the right to act." 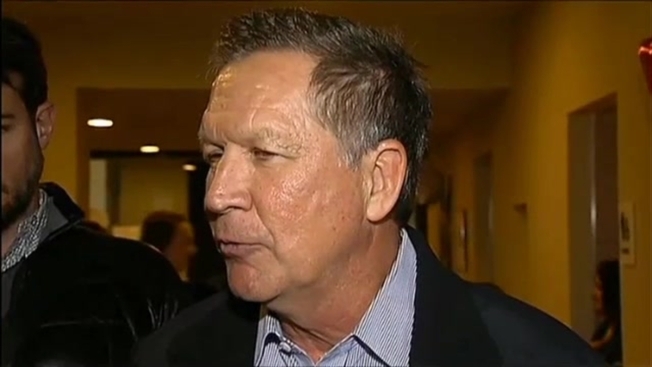 John Kasich says the president is shoving his executive orders down Congress's throat. Kasich doesn't like the process even as he agrees with some key aspects of the executive order, like the request for an additional $500 million from Congress to increase access to mental help. Kasich said, "... The mental health piece is something that Congress should pay attention to." Kasich says the Obama administration has been a failure at working with Congress. Chris Christie compared the president's actions to a petulant child, though he would not engage on the details of the order and had only this to say about Obama's teary moment: "I will not make judgment on the presidents emotions. That is up to him." Scott Spradling added that the presidents tears, "May cause at least some paws on the campaign trail by Democrats, but I think Republicans who wanted him out of office for eight straight years will not stop because of a few tears." Also campaigning today, Jeb Bush, Marco Rubio, and Rand Paul all condemned Obama's executive order.